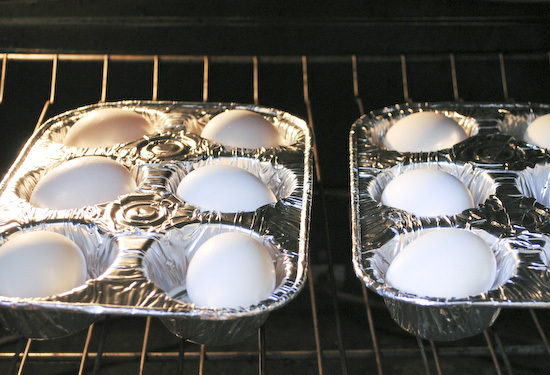 My newest fun thing to do with my handy dandy Handi Foil (our sponsor today) muffin tins is to bake eggs in the oven! I’m sure you have seen it on Pinterest a dozen time just like me. 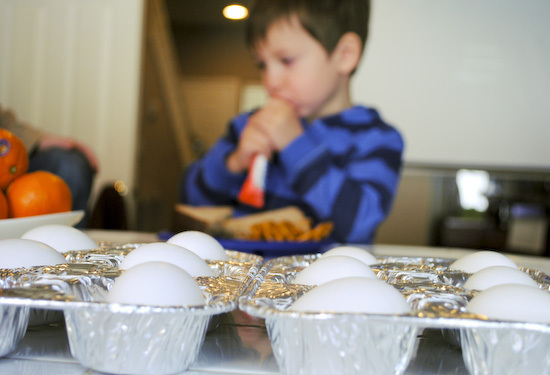 But I thought not only could I bake the eggs in the Handi Foil tins but I could easily use them to have the boys dye the eggs too! 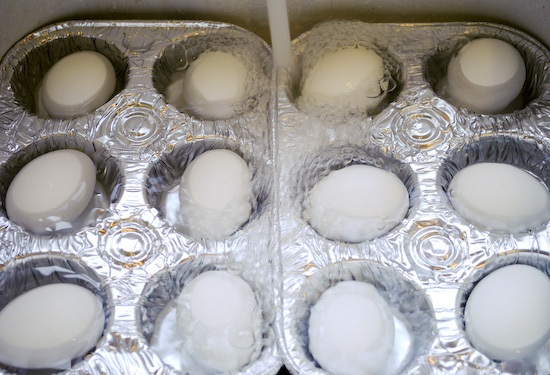 Step 1: Place the eggs into your muffin tin. This was a little trickier than I thought. You have to remember that you need to leave extra space in the tins for when the water rises when you add. So make sure and keep this in mind when filling your tin. I did 2 tablespoons of water to 2 tablespoons of vinegar in each of the spots in the tin. Then I added the little color tablets. I just bought one of those dollar dying kits to make things easy for us. You can use food color to create your dye also. If you just want your egg to be one color just keep rolling your egg until it is the shade you want. Choose a color, usually a lighter color is better, and start dying your egg. Pull the egg out, dry it, and then draw things with a white crayon. Now place it into a new color and dye again. Anywhere the crayon you will see the original color. Place the egg in the dye and do not move! Wait for a bit to let the color set then pull the egg out, flip over and put in a new color. The one nice thing about doing everything in the Handi Foil tins was the quick and easy clean up. Dump the dye and recycle* the tins and you are done. I have seen the baking of the eggs too. I haven’t tried it yet, but want to. Wow, in all my years, I have never seen eggs being cooked in the oven. I am in awe right now! Brilliant! I will definitely try that this year. I have never heard of baking Easter eggs in the oven! Love that you can recycle the aluminum too, so much better than plastic! I’ve been hearing about baking eggs in the oven, but I am yet to try it 🙂 I am so intrigued now! Hmmm.. 30 minutes for eggs is a long time- but I do like the dying process! Trying it right now, I’ll let you know how it works! This is so cool. I like how unique of an idea it is. I haven’t considered cooking eggs in the oven before. Thanks for sharing this idea. What a great fun way to do this!